Picture it: my very first pen show. No idea what I’m even looking for. Lot of cool pens. 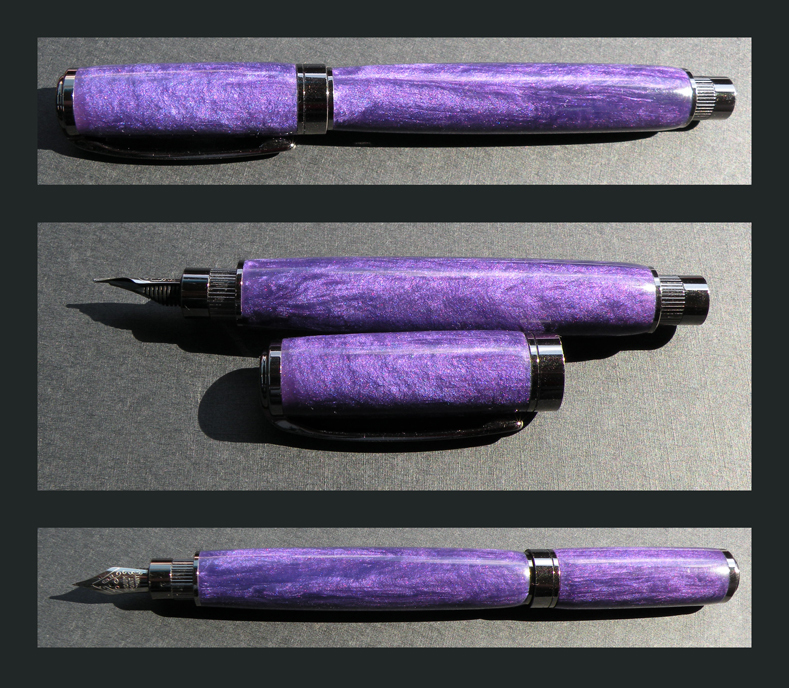 One of the pen makers asks me if there’s any particular kind of pen I’m looking for, and it hits me: dark purple fountain pen. At the time, I had yet to see any in existence. And it just so happens that this particular pensmith is Alan Shaw. 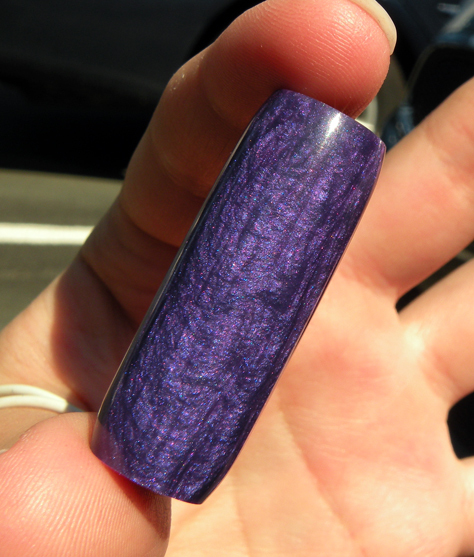 He had done some work recently with dark purple, and he offered to send me a sample. Pictures fail to do it justice. And that’s why I kept pushing back this review, continually seeking justice…and continually failing. 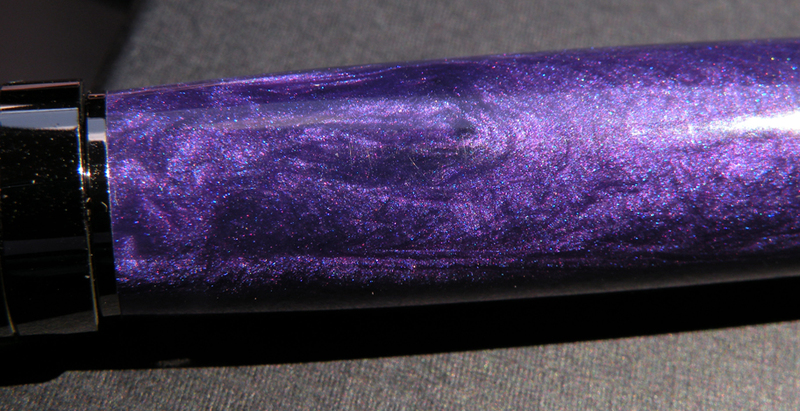 This is not just purple, my friends, but sparkle-infused depths-of-deep-space-hydrogen-clouds purple. 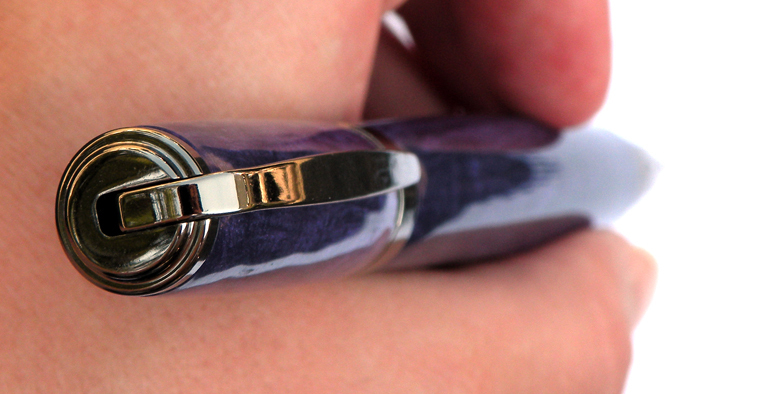 If fountain pens were magic wands, then this would be grade-A wizarding material. 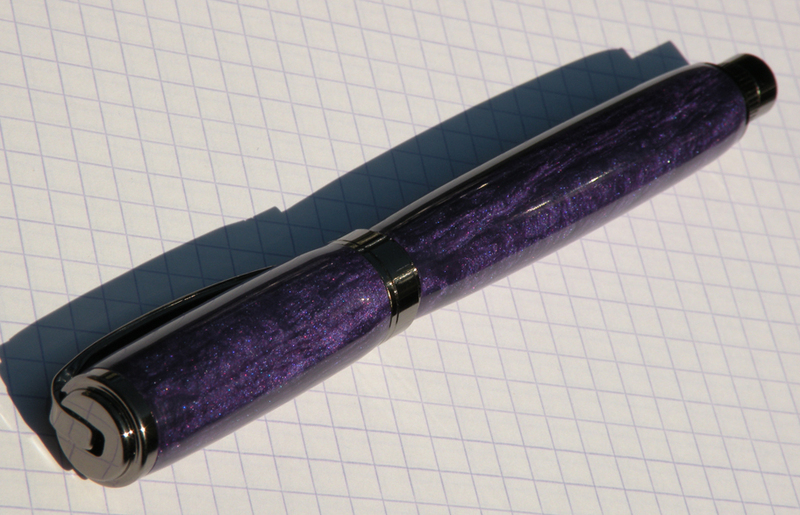 Thus I ordered my first custom-made fountain pen. Seriously. Pictures fail to do it justice. We’ll just have to hang out sometime and maybe you can see it in person. The finished product did not disappoint. It’s big, heavy, and beautiful. I ordered the Gilbert model with steel nib, which has rare earth magnets in the cap, making the cap easy and secure to close and post. Though, in my experience, posting the cap creates a serious Dolly Parton effect—top heavy, unwieldy, singing country music and spawning theme parks. Am I writing or falling over? I can’t even tell. Like a Disney prince. In fact, this might actually be made out of compressed Disney princes. It takes standard international cartridges / converter. 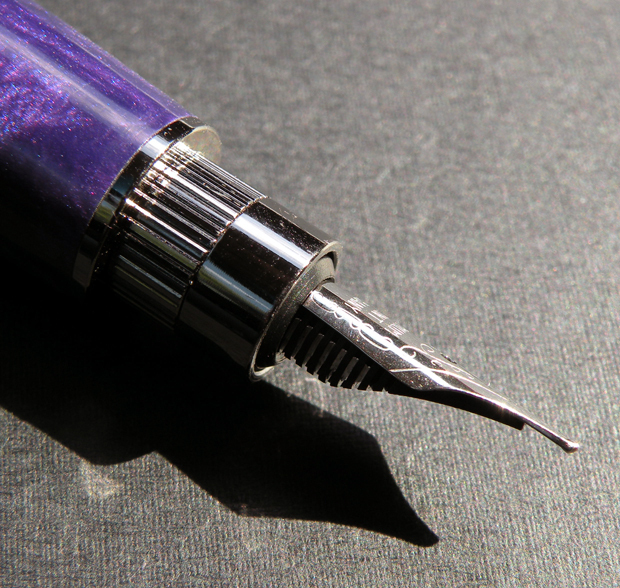 It’s a decent nib, the kind I’ve seen before on other custom-made body kit-nib pens. Mine’s a little on the dry side, very nice for drawing, but I’ll probably work the nib (when I get a little better at that) to be more juicy. Will keep you posted on that. 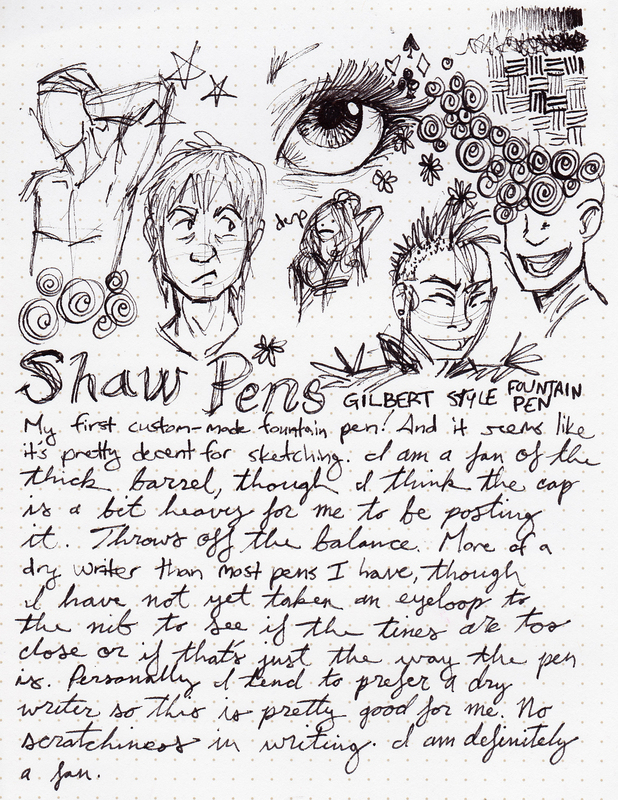 The pen is an absolute delight, and Alan was very easy to work with. The pen came in a nice box, with a converter and a bunch of cartridges. 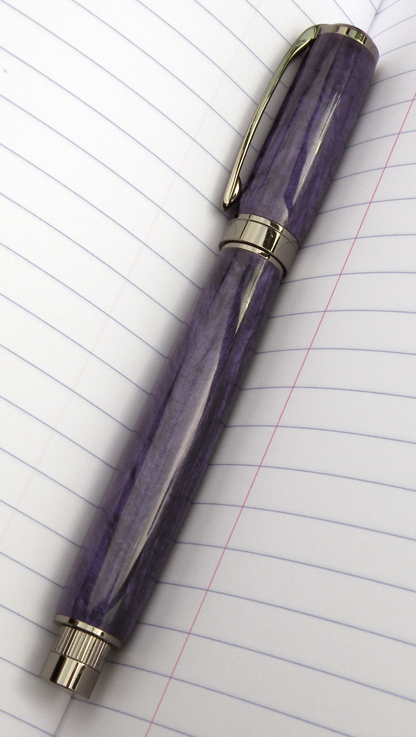 First custom fountain pen is a definite success. Here’s Alan Shaw’s website, and here’s the product detail for the Gilbert model. Thanks Alan! One more picture. Just because we can.